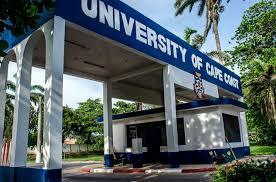 All fresh students and continuing students of the University of Cape Coast and the general public are to take note of the following arrangements for the re-opening of the University for the first semester of the 2018/2019 Academic Year. (a)	Online Registration by Continuing Students – Monday, August 20, 2018 Saturday, September 1, 2018. (c)	Orientation for Fresh Students: Monday, August 27, 2018 – Wednesday, August 29, 2018. (d)	Registration of Fresh Students: Thursday, August 30, 2018 – Friday – September 1, 2018. (e)	Continuing Students Report: Saturday, September 1, 2018. (f)	Lectures Start: Monday, September 3, 2018. (g)	Congregation: Friday, September 14, 2018 Saturday, September 15, 2018. (h)	Adding & Dropping of Courses by continuing students: Monday, September 24, 2018 Friday, September 28, 2018. (i)	Matriculation: Saturday, September 29, 2018. Fresh students are to report at the Porters’ Lodge of the Halls indicated in their admission letters. The list of persons admitted into the University for the 2018/2019 academic year is available online. Applicants can visit https://admissionlist.ucc.edu.gh to check on the status of their admissions. Continuing students should note that they can pre-register their courses for the first semester of the 2018/2019 academic year online before arrival on campus. Students are to do the online registration by visiting their portals via portal.ucc.edu.gh, and proceed with registration of courses. However, registration processes for fresh students will take place at the University’s IT center located at the basement of the Sam Jonah. Both fresh and continuing students are advised to take printouts of their registered courses to their respective Faculties/Schools/Departments for endorsement. All students should take note that, the registration link will be active to only students who have made payment of their fees and have not trailed courses beyond the limit as required by the University. Level 100s and 400s who have trailed courses should take note that registration for resit starts on Tuesday, August 14, 2018 to Friday, August 17, 2018. Prospective re-sit students are required to pay their re-sit registration fee at the cash office at old site and send the receipt to room number DF3 at the Main Administration at old site for onward processing and access to the re-sit time table. Re-sit registration fee is GHC50.00 per paper. The period for the re-sit examination is Monday, August 20, 2018 to Friday, August 24, 2018. Following the past experiences of exploitation of fresh students by drivers to convey them to campus, the UCC-SRC has introduced the UCC-SRC HASSLE FREE TRANSPORT PROJECT which aims at transporting fresh students from the regional capitals and their surrounding towns across the country to campus. Persons who would like to join the buses should kindly contact the SRC PRO, Latif Lawrence Jorhowie on 0547013452 or the SRC Coordinating Secretary, Edith Baafi on 024 232 2041 for further information.